When most people think of that era and its speakeasies, they imagine glamorous and romanticized F. Scott Fitzgerald-like establishments like “21,” The Players Club, the Cotton Club and Chumley’s, where good booze flowed, “flappers” flapped and celebrities, mobsters and the rich and famous rubbed elbows and drank in a fun-filled atmosphere. NYPD 8226b: Photo scenes of shooting at speakeasy at 127 West 33rd St, where 12 men were shot, May 16, 1926. C.A. Carlstrom, NYPD Collection, NYC Municipal Archives. But a trip through the Municipal Archives largely tells a story of the underbelly of that era -- the seamy, down-market “blind tiger” clubs that served up bad booze, deadly fights, murders, scams and robberies. Estimates of the number of speakeasies in New York City range from 30,000 to 100,000 and the overwhelming majority were anything but glamorous. The archives hold some 446 pictures of gruesome speakeasy murders, dilapidated clubs and decrepit halls, bullet-riddled cars, raids on basement still operations as well as mayoral letters and police records that put Prohibition in a decidedly dim light. NYPD 8529a: Automobile, showing bullet holes taken on East 25th Street pier for Insp. Noonon, October 27, 1926. E. Tobin, NYPD Collection, NYC Municipal Archives. The Municipal Library also housed perhaps the most definitive book on Prohibition, The Night Club Era, by Stanley Walker, city editor of the old New York Herald Tribune. In the almost poetic prose of that era, Walker told a tale that encompassed the good, bad and worst of Prohibition in what has long been considered one of the most accurate accounts of that time. NYPD 8926a: Homicide of Thomas Reddington, found dead at 474 Brook Ave., Bronx (a speakeasy), April 9, 1927. George B. Nolan, NYPD Collection, NYC Municipal Archives. New York was never a big fan of Prohibition. In a November 23, 1920 proclamation, Mayor John F. Hylan noted the U.S. Supreme Court had struck down a New York State statute legalizing the sale of 2.75 beer, saying the states “lacked the power to pass such legislation with respect to alcoholic content.” Hylan lamented that despite his preference for a referendum on the Prohibition question, the City Corporation Counsel issued an opinion that said local police were required to enforce the Volstead Act. 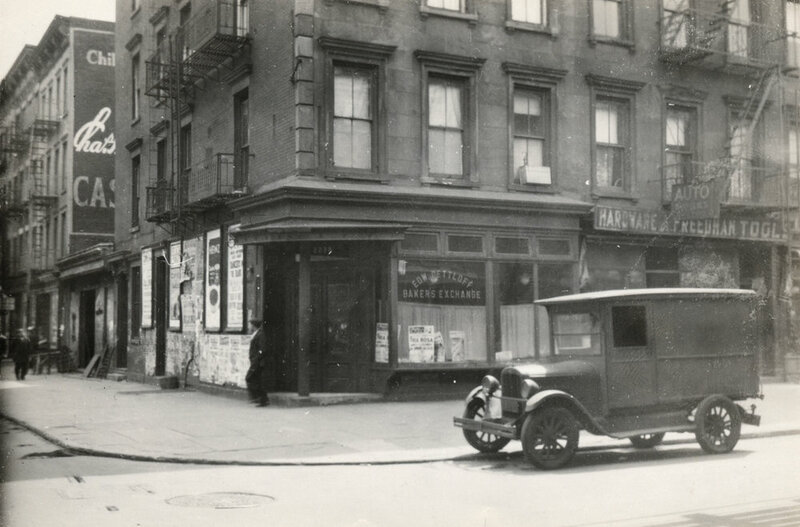 An April 13, 1932 raid on a speakeasy at 115th St. and Second Ave. housed in a store called Baker’s Exchange. NYC Municipal Archives. Archival folders are filled with typed and hand-written letters and petitions from ministers, church-goers and women’s temperance organizations calling on the mayor and Police Department to ban the “wet element” from holding annual “anti-Prohibition parades on The Fourth of July, which, they said, would “attract the lawless and seditious.” But it was too late – not to mention a violation of the First Amendment. Two men entering a “Café” speakeasy at 11 E. 115th St. at 12:45 p.m. The building had circus posters in the window. NYC Municipal Archives. 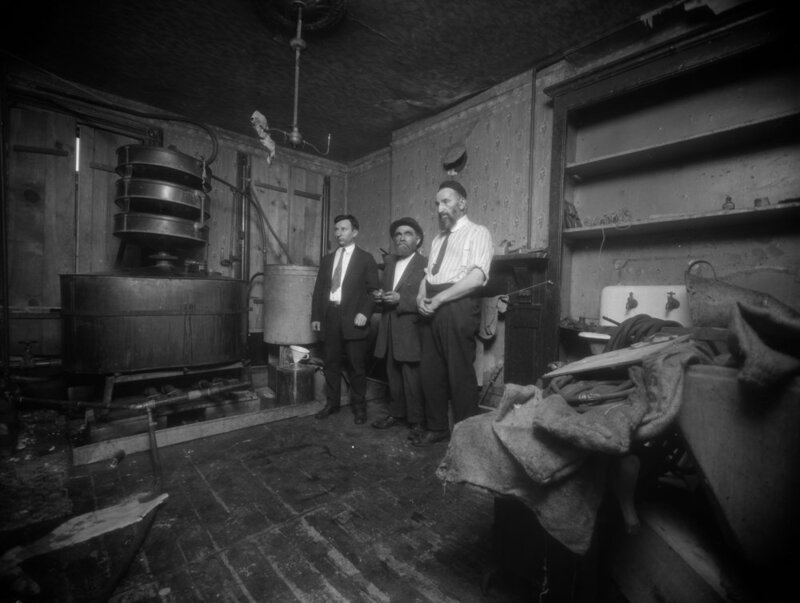 The Archives’ collection is replete with crime scene photos of murders in low-class speakeasies with cheap furniture, peeling paint, walls decorated with pennants and cheap prints, well-worn pool tables and hodge-podge collections of liquor bottles. One of the most notorious speakeasy murders was the December 26, 1925 murder of Irish gang tough Richard (Peg Leg) Lonergan in the Adonis Social Club at 154 20th St., in Brooklyn, allegedly at the hands of Al Capone and others who were still celebrating Christmas in the early morning hours. NYPD 7890c: Homicide at speakeasy at 154 20th Street, Brooklyn. Shooting of Richard (Peg Leg) Lonegan, Aaron Haines and Neil Ferry, December 26, 1925. George B. Nolan, NYPD Collection, NYC Municipal Archives. The December 27 edition of the Brooklyn Eagle breathlessly reported that detectives were investigating the murders of “Richard ‘Peg Leg’ Lonergan, gang leader, and two of his pals as the aftermath of free gunplay that followed a Christmas night revelry in a dilapidated ‘speakeasy club’…” The paper reported that Lonergan and fellow “White Hand” gang members Aaron Heins and Neils “Needles” Ferry “met quick deaths after the revolvers started blazing.” Capone and a few accomplices were arrested but never charged. 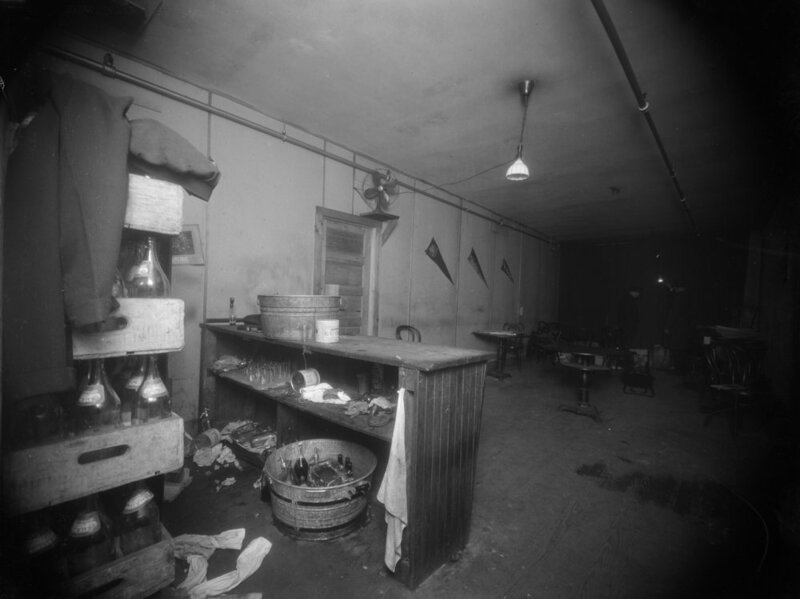 NYPD 8051c: Also photo showing speakeasy where John Daly shooting took place at Hicks and Amity St., February 5, 1926. Det. Gilligan, NYPD Collection, NYC Municipal Archives. Six weeks later, the Archives show a man named John Daly was found shot and killed at a speakeasy at Irving Place and Van Brunt St. in Brooklyn and on May 16, 1926, 12 men were shot in a wild gun battle in a speakeasy at 127 W. 33rd St in Brooklyn (nypd_08226). NYPD 9127a: Photos of 2 stills at #2097 Bergen St., Brooklyn, July 2, 1927. M.W. Butler, NYPD Collection, NYC Municipal Archives. NYPD 9159 Photo of still at 163 Attorney St., July 19, 1927. Det. Gilligan, NYPD Collection, NYC Municipal Archives. Yet, the Archives detail the rising violence it wrought. NYPD 8734e: Photo of stick up and possible homicide of James Masterson at 214 W. 103rd St., 1928. Engbert, NYPD Collection, NYC Municipal Archives. 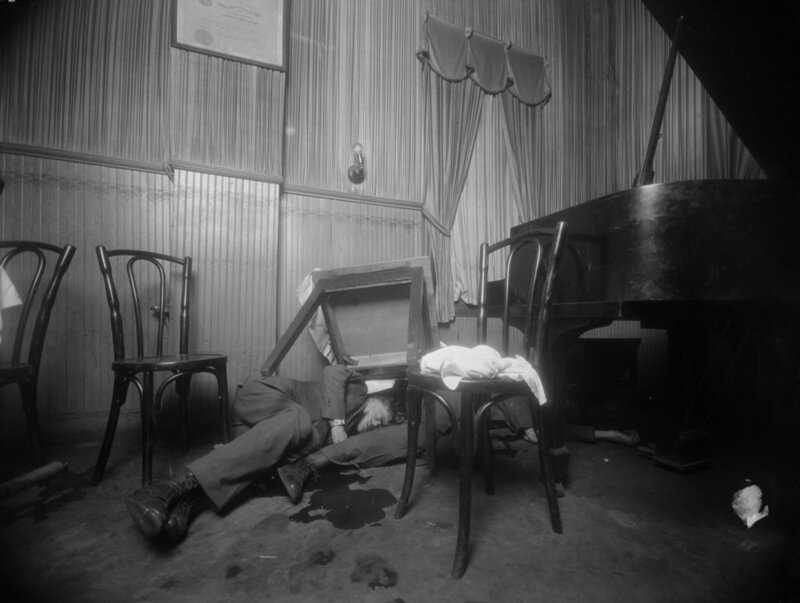 Police officers were not immune to the speakeasy violence. In the 1928 annual report to the mayor, the NYPD said Patrolman James Masterson was shot and killed during an armed robbery at a speakeasy at 214 W. 103rd St. Police arrested Peter Seiler, Walter Tipping and Jerry Cohalen for Masterson’s murder. Seiler was convicted and went to the electric chair in Sing Sing; Tipping was shot to death by police when they tried to arrest him, and Cohalen was committed to the Mattewan Asylum for the insane. Former Mayor Jimmy Walker’s Drinking Set in pawn shop, includes 3 sterling silver quart flasks, May 1935. Associated Press, NYC Municipal Archives. That annual report detailed two 1929 murders: On March 20, 1929, James Donofrio was killed while leaving a club at 103 Christopher St. His killer, Anthony Ferrara, pleaded guilty to manslaughter and was sentenced to 20-to-25 years in prison. On April 28, 1929, Thomas Colby aka Joseph Shields, and John Collins were shot dead in the rear of a speakeasy at 31- E. 32nd St., Manhattan. Killer James Keely was sentenced to 35-to-life. Stanley Walker’s The Night Club Era recounts one of the more notorious speakeasy murders. It was in the summer of 1929 in the Hotsy Totsy Club on Broadway, controlled by flamboyant and hothead gangster Jack (Legs) Diamond. As Walker told it, Diamond and his partner, Charles Entratta aka Charles Green, were tending bar when three waterfront toughs named Simon Walker, William (Red) Cassidy and Peter Cassidy walked in and soon got into an argument with Diamond and Entratta. NYPD 9348b: Photo of body and scene where Jacob Orgen, alias Little Augie, was shot and killed in front of 103 Norfolk St., Manhattan while in the company of Jack Diamond, October 15, 1927. George B. Nolan, NYPD Collection, NYC Municipal Archives. “Diamond and Entratta pulled their guns,” Walker wrote. “Red Cassidy fell with a bullet in his chest and Diamond, leaning over him, emptied his gun into him. Peter Cassidy was badly wounded but not killed. Simon Walker … was shot and killed by either Diamond or Entratta.” Entratta was acquitted at trial – after two witnesses were killed and a third went missing forever. Diamond was not charged. By the end of 1929 – the year of the infamous St. Valentine’s Day Massacre in Chicago – Americans were totally fed up with Prohibition and the end seemed near. It came on December 5, 1933, when Congress finally repealed the 18th Amendment – ending a foolish law that spawned violence and gave rise to organized crime. Tens of thousands of New Yorkers celebrated with a drink or two.